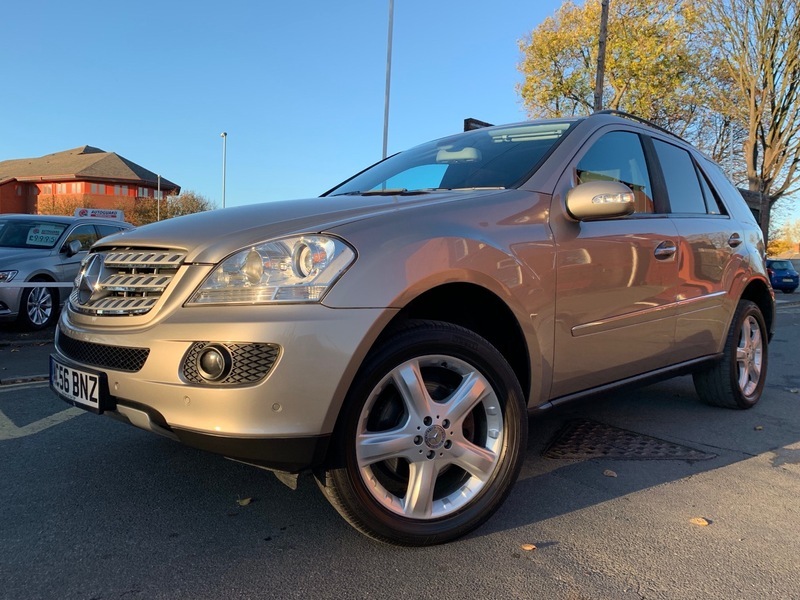 THIS IS A CRACKING EXAMPLE OF THE MERCEDES ML AND THE PLATE COMES WITH THE CAR, ITS A ML320 CDi SPORT FINISHED IN METALLIC CUBANITE SILVER WITH HALF BLACK LEATHER/SUEDE UPHOLSTER, FULL SERVICE HISTORY, LOVELY SPEC WHICH INCLUDES, REMOTE CENTRAL LOCKING, PAS, ABS, ELECTRIC WINDOWS ALL ROUND, ELECTRIC ADJUSTABLE AND FOLDING MIRRORS, ELECTRIC TILT/SLIDE SUNROOF, ELECTRIC TAILGATE, DUAL ZONE CLIMATE CONTROL AIR CONDITIONING, COLOUR SATELLITE NAVIGATION, RADIO CD PLAYER WITH STEERING WHEEL MOUNTED CONTROLS, HEATED FRONT SEATS, AUTO LIGHTS AND WIPERS, FRONT AND REAR PARKING SENSORS, BLUETOOTH PHONE SYSTEM, REAR PRIVACY GLASS, CRUISE CONTROL WITH SPEED LIMITER, 19 INCH ALLOY WHEELS, MULTI FUNCTION STEERING WHEEL, HEIGHT ADJUSTABLE DRIVERS SEAT AND STEERING WHEEL, COLOUR CODED BUMPERS AND MIRRORS, FULL COMPLIMENT OF AIRBAGS AND SAFETY FEATURES. A WONDERFUL EXAMPLE AND READY FOR WINTER. P/X Welcome, Finance Arranged, Please Contact Andrew on 07947 884458 For Further Information and to Arrange a Test Drive.